Morning after breakfast and drive to Mandawa. Arrive Mandawa & check in hotel. Later proceed for city sightseeing tour of Mandawa, founded 1755 by Thakur Nawal Singh and still the home of his descendants has beautiful frescoes, Havelis and mansions. Mandawa castle one of the finest castles of Rajasthan, is now a hotel and house of collection of armories, costumes of ancestors, canons from 1820 ancient coins, numismatic collection and many other interesting items, preserved in a museum. Night stay at Mandawa. Morning after breakfast drive to Bikaner. Arrive Bikaner & check in hotel. Later proceed for city sightseeing tour of Bikaner. Bikaner is named after its founder Rao Bika Ji in 1488. But long before this, the city was trade center on the caravan routes from Africa and West Asia. Bikaner's dominant features are rippling sands and abundant sunshine. The city stands on an elevation, enclosed by a 7 Kms wall, which can be entered from 5 gates. Bikaner City is bolstered by imposing walls and has a 16th century fort housing old palaces, temples and mosque. Founded by Raja Rai Singh the fort is distinguished by its long range of 37 pavilions, a line of balconies and aerial windows of varying designs. Also visit Lallgarh Palace, the museum, and Bhanda Sagar Jain and Deshnoke Rat temple. Night stay at Bikaner. Morning after breakfast and drive to Jaisalmer en-route visit the small town village Pokhran.It is also called the heart of Thar Desert. The magnificent Pokhran red sand stone Fort rises from the yellow desert sands. This fort offers traditional hospitality and shelter that, as history records, was once offered to the fugitive Humayun, Mughal emperor as he rested here until he restored in a position to travel to Persia. Since then rugged fort has opened its gates to tourists and the descendants of Humayun's hosts go out their way to make the visitors comfortable and memorable. It has a large collection of rare weapons, paintings historic relics, period dresses and head gear's on display. Other interesting events that occur here are craft on display and folk music concerts. 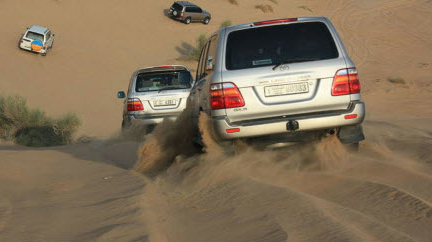 After sightseeing continue drive to Jaisalmer . Arrive Jaisalmer and check in hotel. Night stay at Jaisalmer. Morning after breakfast proceed for excursion to Khuri. 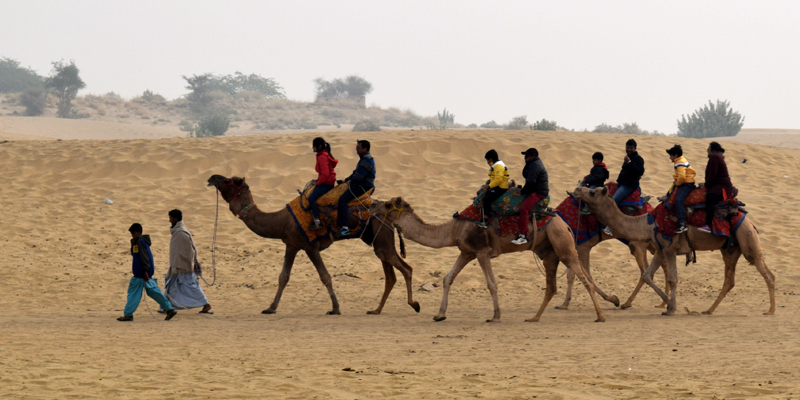 Khuri is 45 kms from Jaisalmer on other side of the Sam. It is surrounded by Desert Hills and is becoming a popular destination to those who are in search of traditional village life. 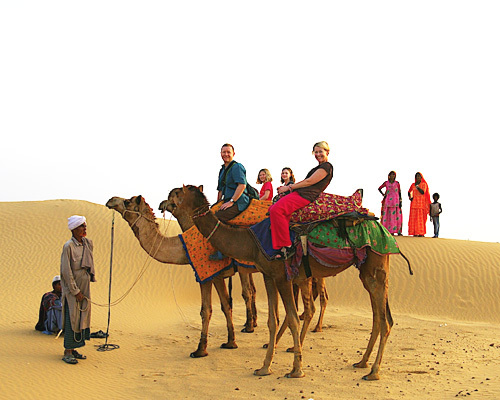 At Khuri Village, experience the romance of desert in the most fascinating way. 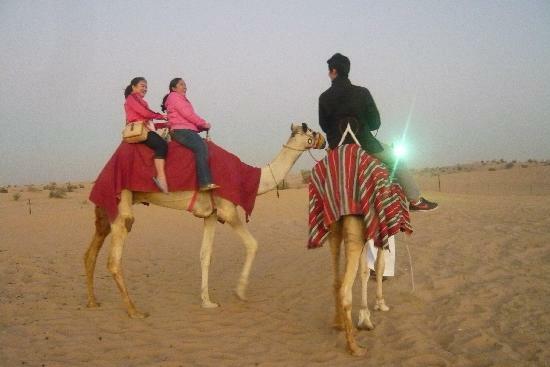 Camel Ride and Enjoy Desert Sunset. After visit drive back to Jaisalmer. Night stay at Jaisalmer. Morning after breakfast and drive to Jodhpur. Arrive Jodhpur & check in hotel. Later proceed for city sightseeing tour of Jodhpur. Mehrangarh Fort, the original fort was constructed by Rao Jodha in 1459 after whom the city has been named. See the cenotaph Chattri of Kiratsingh Sodha, Jayapol, Fatehpol, Lohapol, Phool mahal, Zhanki mahal, moti mahal and a museum in the fort which has interesting artifacts. Jaswant Thad, Umaid Bhawan Palace and Clock Tower. Night stay in Jodhpur. Morning after breakfast and drive to Ranakpur. Arrive Ranakpur & check in hotel. Later proceed for city sightseeing tour of Ranakpur, visit the world famous Jain Temple Ranakpur. The exceptionally beautiful Ranakpur complex is one of the largest and most important Jain temple in India. The main temple is the Chaumukha Temple, or Four Faced Temple, dedicated to Adhinath, built in 1439, this huge, superbly crafted and well-kept marble temple has 29 halls supported by 1444 pillars, no two alike. Night stay at Ranakpur. Morning after breakfast and drive to Udaipur. Arrive Udaipur & check in hotel. Rest of the day at leisure. Night stay at Udaipur. Morning after breakfast proceed for city sightseeing tour of Udaipur, the city is built in 1559. A.D. by Maharaja Udai Singh and has been described the most romantic spot on the continent of India by Col. James Todd. Visit the city Palace Museum, The Jagdish temple, Sahelion ki Bari (Queen’s resort for their friends) Bhartiya Lok Kala Mandir (Folk Art Museum) and the Pratap Memorial. Also enjoy Boat ride at Lake Pichola – Depend on water level. Night stay in Udaipur. Morning after breakfast departure transfer to the railway station to board the train for Delhi. Overnight in train. Arrive Delhi, pick-up from railway station and transfer to hotel. Later proceed for city sightseeing tour of Delhi visiting Old & New Delhi. Morning after breakfast departure transfer to the airport to board the flight for onward journey. Tour ends with sweet memories.